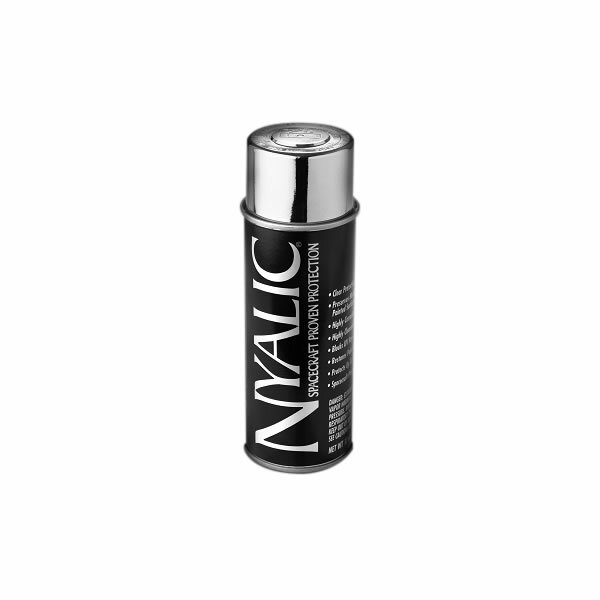 Nyalic Aerosol Can – 12 oz Covers up to 95 ft². Q: Can this be used on the surface of a wood dining room table? Thx! A: While Nyalic can be used on wood, over varnish and in other ways on wood, we do not recommend using Nyalic on top of a dining room table. Q: Can this aerosol spray be used to treat scratches on an aluminum anodized sailboat mast? A: Absolutely it can!! Proper surface preparation and touch it up using an aerosol can. If the scratch is really deep or if there is bad oxidation then more extensive prep work may be necessary. We have information on mast restoration available upon request. Q: Can Nyalic be sprayed over marine polyurethane paint with vinyl stick on lettering? A: Yes, absolutely! Proper surface preparation is key. We recommend testing a small area on your vinyl lettering to be safe. As an added benefit, the Nyalic will keep the lettering from fading and edge roll-up. Q: Can I put this on a exhaust pipe from a dirt bike? Need something to protect the pipe, but I'm not sure if it'll get too hot. A: Absolutely, you can put Nyalic on your exhaust. Keep in mind that Nyalic is good up until 350 degrees Fahrenheit. If the exhaust gets hotter than that then the Nyalic will melt off. Q: I'm making an outdoor pet enclosure and want to protect the painted wood from urine (but also not poison my cat). Would this product work for that? Q: What is the longevity of nyalic in an undercoating situation? I would like to spray it under my truck for corrosion protection. Q: can you put this on a varnished wood exterior door? is the finnish glossy or satin?